Books by and about African Americans are on display in the first floor Periodicals area. February is Black History Month. 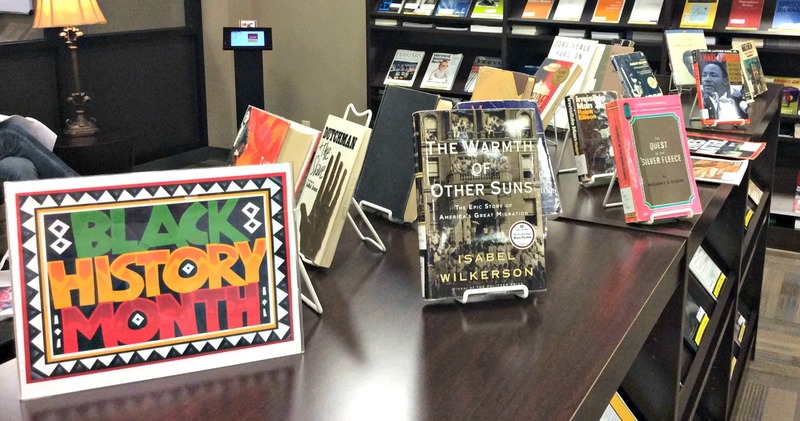 Explore these online resources to learn more about black history and culture, or stop by the Library’s first floor lobby and in the Periodicals area and check out our displays containing books and movies by and about African Americans. Black Thought and Culture contains more than 1,300 sources focusing on the published nonfiction works of leading African Americans, including interviews, journal articles, speeches, essays, pamphlets, letters and other fugitive material. In some cases, the complete published non-fiction works are included. Ethnic NewsWatch is actually two databases in one. Ethnic NewsWatch: A History offers a rare collection of more than 30 full-text titles from the African American, Hispanic American, and Native American presses from 1959-1989. Ethnic NewsWatch covers 1990 to the present and includes newspapers (including the Chicago Defender), magazines, and journals of the ethnic and minority press, providing researchers access to essential, often overlooked perspectives. Black Literature Criticism is a publication that focuses on writers and works published since 1950. The majority of the authors surveyed are African American, but representative African and Caribbean authors are also included. It provides beautiful illustrations of the authors, along with a great look into the works of notable authors such as Gwendolyn Brooks, Octavia Butler, Ousmane Sembene, and many more.